We offer syringe pumps, which are portable & unique apparatus specially designed for neonatal, pediatric and adult patients who require superior accuracy, dependability and security when it comes to infusion therapy. It is widely used for intravenous infusion, intraarterial infusion, peritoneal medium & radiography infusion, anaesthesia infusion and chemical therapy in the different departments of hospitals. 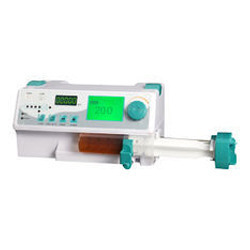 Some of the syringe pumps in different we offer are discussed as below: BYZ 810 Syringe Pump We offer ETCO2 Monitor, that is also known as Capnograph monitor, is used to measure end tidal carbon dioxide EtCO2 or ICO2 and respiration rate. Based on the state-of-art technology, this monitor can verify critical ventilation and oxygenation information in any type of clinical setting. Lightweight and portable, it is ideal for both intubated and non-intubated patients. Freely Stackable You freely stack one onto another to provide multiple solutions, combination solutions that have a wide range of clinical applications. Digital LCD display: High capacity words, friendly user interface, dynamically display working status. Positive and Negative Shuttle Debugger: Can freely regulate parameters. Applicable to all domestic brands and all kinds of syringes. Time-Volume Mode: By setting the time and injection volume, the system does the injection after automatic speed calculation. Dosage Weight Mode: By setting the volume, weight, medicament, dosage, the system does the injection after automatic speed calculation. Easy Speed-Setting Mode: The normal one hospitals used. Function to Preset Solution Volume: The user can preset solution volume. The machine will automatically stop and start KVO function once the preset solution volume is finished. he machine automatically records the settings for last injection. It greatly reduces the workload for users. Complete calibration technology for syringe brand definition that ensures the compatibility of any syringe brand and injection accuracy.